It does not matter whether Chavez remains at Miraflores Palace until he dies of old age in his sleep: this week his revolution died. The students might succeed in overthrowing Chavez, or might go home when they get bored, or might end up in a blood bath. But in three days they have nailed the coffin of the pseudo revolution that has been tormenting us for too long. When Chavez closed RCTV he made the fatal mistake that all revolutions, real or spurious, make, that mistake that sooner or later will bring them to their end. In some revolutions it is easy to see that turning point, even if they are still running. For example there is an expiration date for the Cuban revolution: Mariel. Some, like me, place it when Castro sent Cuban soldiers to die in Angola. It is a simple matter of accurate dating. It does not matter that Castro is still holding office with one foot in the grave, the Cuban revolution then became only a system to perpetuate a caste in power. What could Castro argue after Mariel, when over 100 000 people tried to flee their country at any cost? Castro and his system only survive because Cuba is an island which holds no strategic interest for anyone anymore. The Chinese Revolution died when it became “Cultural”. From those excesses would come Deng as the “counter” culture who would catapult China to its rank if not yet the prestige it should deserve. Nobody knows how will its mad race to Capitalism end up, though that mad race seems to become a revolution of its own. The French Revolution died the day the scared sub-par revolutionaries decided to guillotine Robespierre before he got them. One thing lead to another until in 1799 Napoleon put a final point to the French Revolution. After Robespierre, the aim was to reestablish order in the country, so those who got to riches or to power could enjoy them. Before Robespierre demise there was a search for Utopia, even if the “comité de salut public” was already establishing the first totalitarian state. After Robespierre, bourgeois comfort would become the rule except for a brief moment in 1848 where Marx found a lot of inspiration. The Soviet Revolution died when it built the Berlin Wall. It had gotten sick when Stalin started the show trials in the 30ies, but the war gave it an unexpected remission. When Stalin split Berlin into two, the idealism left the Soviet experiment for good: from then on we had two empires at war, no more a revolution defending its social conquests, such as those might have been. The revolution was just an old crone clinging to its baubles. The Mexican Revolution died when its morally diminished leaders decided to form the permanent revolutionary party, the PRI, who established just a “perfect dictatorship” that lasted most of a century. A new social class of power was formed from scratch and it had very little inclination to share. So why should it be different for the Bolivarian Revolution of Hugo Chavez? The only variation here is the pitiful whimper in which it goes out. 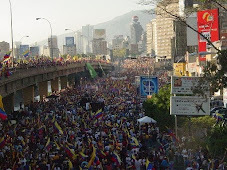 Where other revolutions died with violent paroxysms or stupendous contradictions, here the hypocrite, weak, feeble minded pseudo revolution behind which an old fashioned caudillo hid had to end on the closing of a single TV station and the student protests it sparkled. Chavez was created by the media, the famous “por ahora” of 1992, so it is only fit that killing one of his parents would end his romantic revolutionary career. We should not be surprised that his revolution based on social revenge more than on any social justice should flounder against the true egalitarian spirit that student revolts always generate. The students who are protesting are giving us luminous and glorious days. In a fantastic irony, today student press conference was held on open air benches, in the gorgeous Universidad Simon Bolivar campus flooded with a rare clarity and transparence that the tropical humid air is so stingy with. It has been years that we, Venezuelans, had seen such clarity in our thoughts, in our hopes. The murkiness of 8 years of oppressive and materialistic chavismo was suddenly lifted when we were recalled this week that there are values that are worthwhile fighting and dying for. Freedom of expression is such a value, and chavismo cannot understand, will not understand that no amount of free aspirin in Barrio Adentro ill staffed clinics will ever compensate for the loss of freedom of expression. That is why no matter how many years Chavez might still be in power, his cheap revolution ended this week. It will be now a mere drawn out autopsy.